Gillian Lee Smith: New Studio!! New Studio! !, originally uploaded by gilfling. Well it is hard to believe that we have now been living in this house for over a month and my studio has been set up (in a fashion) for most of that time. It really was a priority for me to get this room in a workable state as soon as I could and although I am getting there, boxes are still to be unpacked and spaces are still to be found for things. As vast as this room seemed on first sight, I am still suprised at how easily it has been to 'fill it' and every corner is home to something or other. What space does afford me, however, is the ability to actually move around and spread my work around without feeling inhibited or as if I am constantly tripping over something (other than the rug which I have put down to protect the cream coloured carpet for when I am painting - this rug stubbornly refuses to lay flat and curls up creating tunnels under which threads gather, and over which I am constantly and fustratingly tripping). This room in the house was, I guess built for the purpose of being the main bedroom and is on the second floor. Apart from the staircase up to it and a small cupboard outside the door, it actually fills the floor plan of the entire house. Behind this photo is another 5 or 6 feet of floorspace only made smaller by the sloping ceilings. Indeed I feel very fortunate to have this space and it has been and is a joy to work in - just far enough away from the main body of the house so as not to be too distracted by dishes and other chores, but with the much wished for access of stairs rather than the dreaded and dangerous (to me) ladders of my last home studio space! I still need to completely clear my painting studio (a 'must do' job for this week) and my painting area will be to the left of the photo above which is nearest the one and only window in the room (the only teeny weeny negative aspect of the space as the window is quite small and the light only really reaches half of the room so lighting purchase have been made which do help a great deal). If you have a look at the image on my flickr page you can see my notes describing the various storage in the shelves and I hope to take more photos soon of the other sides of the room once I have a few more boxes unpacked! 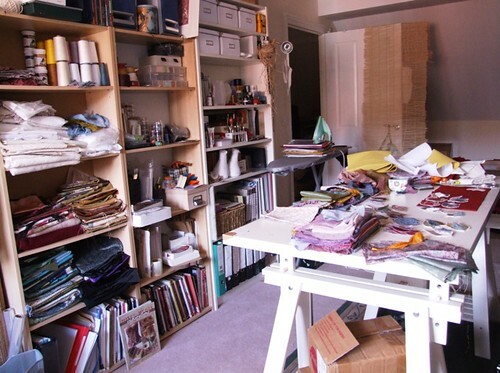 I had almost waited until the room was 'tidy' to show you but actually I soon realised that this is my 'workspace' and as such it is never going to be beautifuly neat and 'publication worthy' so best just get on with it and show you it as it is meant to be! We are away camping for a couple of days this week so I do hope you are enjoying your summer days no matter the weather and I will have more photos to show you soon! Looks like a lovely place to work.